Since the Country Music Association decided to hold their annual awards show in 1967 to celebrate, appreciate, and honor the genre’s most talented individuals, country music has only continued to grow. With its hilarious hosts, creative collaborations, and stunning performances, the CMA Awards seems to get it right every time—and this year was no exception. Last night’s 50th Annual event left us reeling from endless highlights, but luckily we were able to narrow down all of the memorable moments to five. If you weren’t able to catch the biggest night in country music for yourself, check out our list of the best performances from the night below! It was a big night for country pop newcomer, Maren Morris. The songstress dominated this year after her fourth studio album, Hero, peaked at No. 5 on the Billboard 200 chart. The Nashville native wowed attendees with a soulful rendition of her hit song, "My Church", which she sung along with a backing choir, making us feel totally blessed (insert praying hands emoji here). The queen of country, Dolly Parton, was honored with the Willie Nelson Lifetime Achievement Award, and a mashup performance from two of music's hottest names. Jennifer Nettles and a capella group Pentatonix delivered an upbeat, genre-bending performance of Parton’s late-'70s hit “Jolene”. Featuring Pentatonix’s signature harmonies and Nettles’ blues-y vocals, the classic song saw a modern makeover for the books. Little Big Town also had a successful night, but this wasn’t the band’s first time taking on the CMA stage. The country quartet took home their fifth consecutive award for Vocal Group of the Year, and took to the stage to perform their newest track, “Better Man”, which also happened to be written by longtime friend and collaborator Taylor Swift. The news came as a shock to Little Big Town fans and Swifties alike, considering that the writer of the song was left anonymous until Tuesday. At this point, it’s pretty safe to say that country music fans are obsessed with Carrie Underwood. The singer took a break from hosting the show alongside Brad Paisley to wow the crowd with a performance of her single “Dirty Laundry” off her fifth studio album, Storyteller. The songstress pumped the crowd up with a sassy, rock’n’roll infused performance that got the audience on their feet, giving us major “Before He Cheats” vibes. 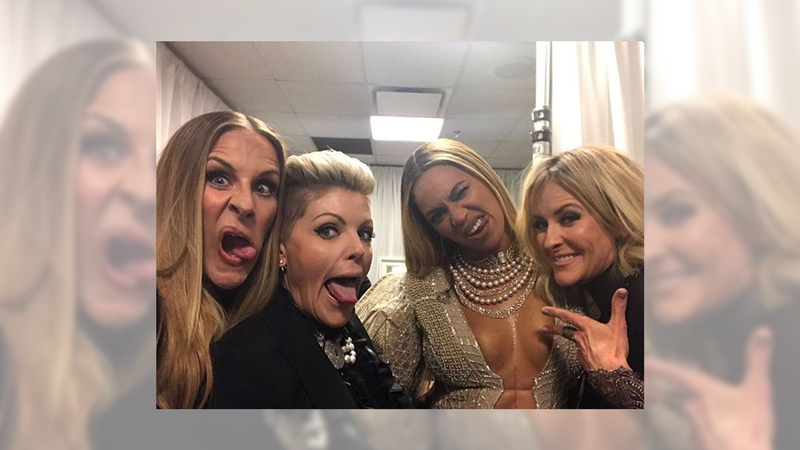 The biggest curve-ball and most talked-about moment of the night was hands down, Beyoncé’s performance of “Daddy Lessons” with the Dixie Chicks. The fact that the country music world showed their love for surprise album Lemonade earlier this year may have been our only hint that the "Formation" artist would do something at the CMAs. One of its many appreciators, Dixie Chicks, began covering "Daddy Lessons" at their live shows. Months later, the musicians decided to grace the CMA stage with the R&B songstress, and the rest was history. "Ok! I can finally talk about one of the greatest weeks of my life! Thank you @Beyonce ! You slay. All day" - @1nataliemaines Grab your free download of #DaddyLessons too - link in our bio!